In Iowa, in order to perfect a mechanic's lien, the claimant must make a filing with the clerk of the district court of the county in which the building, land, or improvement to be charged with the lien is situated of a verified statement of account of the demand due the person, after allowing all credits. I.C. 572.8(1). The verified statement must include: 1) the date when such material was first furnished or labor first performed, and the date on which the last of the material was furnished or the last of the labor was performed; 2) the legal description of the property to be charged with the lien; and 3) the name and last known mailing address of the owner of the property. Id. Once the lien is filed, the clerk of court will mail a copy of the lien to the owner. 572.8(2). This article is provided for informational purposes only and should not be relied upon as a substitute for the advice from a legal professional. 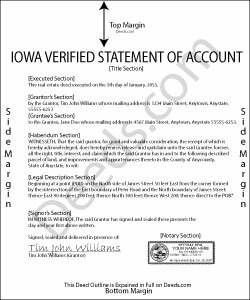 Please contact an Iowa attorney with any questions about the verified statement of account or anything else with regard to mechanic's liens. lee s. said: Over all quality of document was good. The issue I had was where it states claimant did not have a contract with the owner or their agent. I did have a contract with their agent, and there was no option for both. So had improvise.